This is a first state of Ruscelli’s regional map of the southern half of the United States and Mexico, including Florida and Texas. Ruscelli’s map is based on Giacomo Gastaldi’s map of 1548, but is larger and depicts Yucatan as a peninsula rather than an island. This is the second earliest obtainable map of the area depicted. Many rivers emptying into the Gulf of Mexico are depicted, and Florida and Cuba are named. Mexico City is shown in the middle of its lake. California is shown as a peninsula. Italian text on the verso describes Mexico and its great city in a lake, Tenochtitlan. 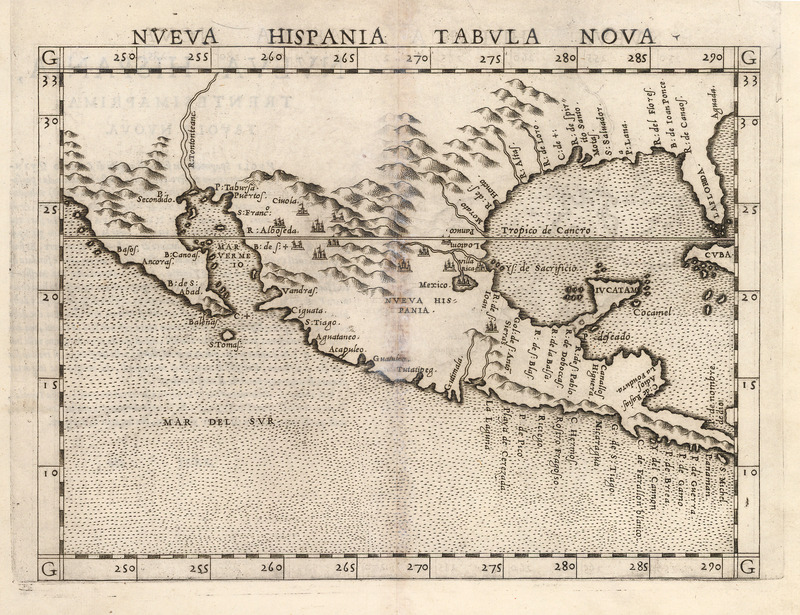 A better regional representation would not be available until Wyfliet published his map in 1597. Condition: This map is in B+ condition. Professional repair with archival material on the verso and slight discoloration along the centerfold.